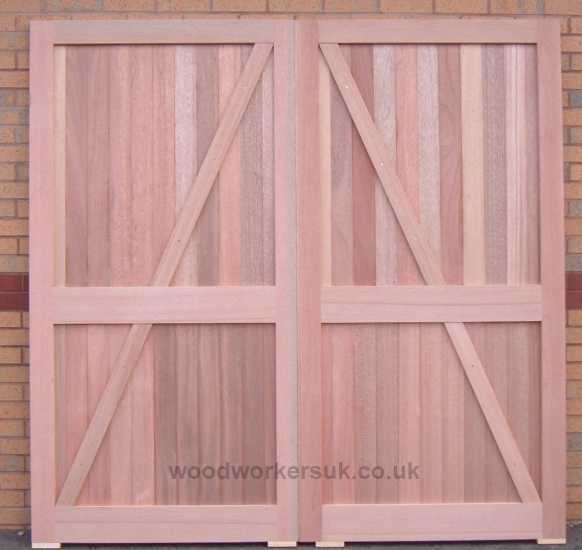 Do timber side hinged garage doors come much stronger and well built as these? Three solid, full thickness rails, wedged morticed and tenon jointed framework – give them a go if you dare! Uniquely structured with an offset central timber rail (this can be lifted up or dropped to suit whatever you need – please contact us!) for strength and rigidity. We also happen to think it looks rather nice! The simple elegance of these doors, matched with our joinery expertise and combined with beautiful timbers is the answer to your garage door prayers! The Menai garage doors are supplied fully finished sanded ready for final decoration, whether you choose the hardwood or softwood versions each can be painted or stained – we don’t use ‘joinery grade softwood’ so you have no problem in staining the softwood – it looks just as good! A pair of our Menai garage doors in painted Softwood – However we don’t use ‘paint grade softwood’ so they look great stained too! Rear shot of our Menai doors, shown this time in Meranti (Hardwood). Three solid, full thickness rails? As mentioned above the Menai doors have three solid full thickness rails, another words if you look at both the front and back of the doors then the three rails are visible from both sides of the doors. 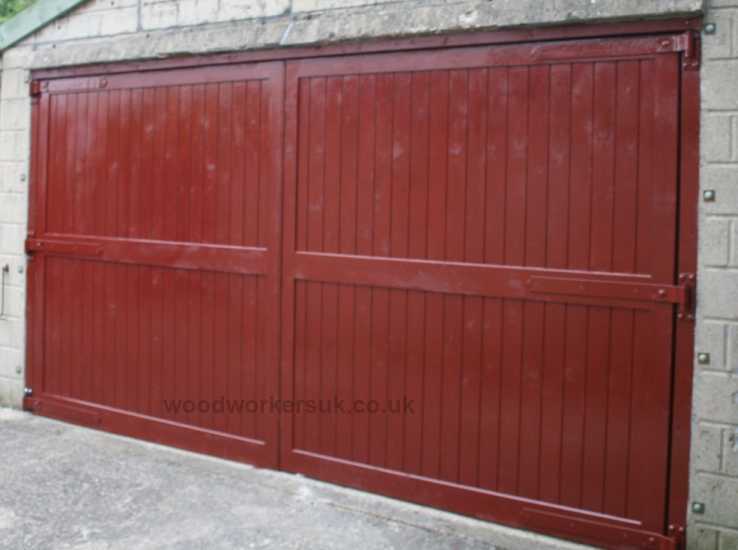 Because of these three solid rails, the Menai timber garage doors are ideal for larger openings where strength is required and also a perfect choice if your looking to automate a pair of side hinged garage doors. Bottom & Centre rails – 5 3/4″ x 1 3/4″ / 145mm x 45mmRebated meeting stiles (the doors overlap when closed). 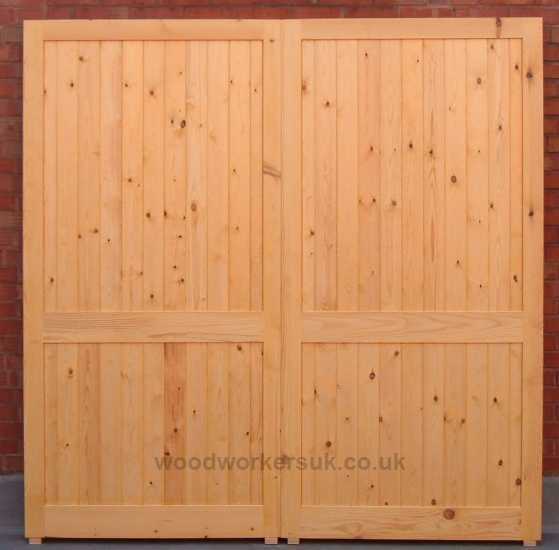 The Menai guide prices are based on a pair of doors 6ft 6 high x 6ft 6 overall wide (approx 1980mm x 1980mm), these are NOT from prices, smaller doors will be more economical etc – contact us for a price! All prices are correct time of insertion and are EX VAT. Free delivery to most parts of the UK mainland is included – exclusions do apply, again please contact us. Mad about our Menai? To get a personalised costing on our Menai timber side hinged garage doors please use the form below.